Dining is one of the greatest pleasures during a visit to the Mississippi Gulf Coast. The influence of French, Cajun, and Creole cooking is similar in some ways to neighboring New Orleans, but Mississippians offer their own adaptations that should not be missed. Here's what you need to eat on your next visit. If you don't want to munch your shrimp as it falls from the inside of a Po'boy sandwich, perhaps savoring an Étouffée is more your style. This dish (pronounced Ay-too-Fay) features large Gulf shrimp or crawfish prepared in a rich, spicy onion and roux-based sauce. This Cajun stew creation can be found from Florida to East Texas, and although shrimp is the common shellfish ingredient, it often is served with whichever catch is most plentiful on a given day. A large portion of white rice is included but can be ordered as a side dish for those who don't want to mix the rice and the other ingredients. In Biloxi, Mississippi, Mary Mahoney's Old French House serves some of its featured fish dishes with a topping of Crawfish Étouffée. The idea behind a po'boy sandwich is to heap a baguette (French bread) with a large helping of whatever is plentiful. So you might see turkey and dressing po'boys around Thanksgiving Day, crawfish po'boys, or maybe that local favorite, the shrimp po'boy. Legend has it the original servings in New Orleans went to unemployed workers during the Great Depression. Beggars couldn't be choosers. The Mississippi version also is worth trying, especially if it is brimming with shrimp, which is the state's most bountiful seafood product. As you might have guessed, this is not a meal you'll eat with a prim and proper approach. Po'boys are sloppy, and you'll probably have to extract some of the shrimp from the baguette prior to that first bite. Sometimes, a po'boy is dressed with lettuce, onion, and mayonnaise. Yellow mustard and hot sauce are commonly at arm's length at places serving the sandwich. In Gulfport, Louisiana, Blow Fly Inn Restaurant serves six kinds of po'boys. Diners, Drive-ins & Dives, and Emeril Live both have introduced the restaurant to their respective television audiences. It doesn't take much imagination to deep-fry a breaded tomato slice. Some places, that's about all you'll find on your plate. But Mississippians have been known to raise this simple dish to a culinary art form. Start with a thin tomato slice, and add a smattering of your favorite seafood, perhaps some crab meat or shrimp. Then, ladle on some ravigote sauce (a French creation featuring a vegetable or meat broth and Dijon mustard). Still skeptical about fried green tomatoes? Split an order or two. Warning: some people get hooked rather easily after starting with "OK, I'll try it." Want to try? Atchafalaya Restaurant in New Orleans, Louisiana, serves these crispy coated tomatoes with crabmeat and spicy rémoulade as an appetizer. As you wander the coast, you'll be invited to try crawfish in a host of varieties. A favorite along the Mississippi coast is Crawfish Monica, which pairs creamy pasta with crawfish and a Cajun-seasoned sauce. The Harbor View Cafe in Long Beach, Mississippi, features Crawfish Monica on its lunch/dinner menu. Hurricane Katrina wiped out this restaurant, but The Harbor View was rebuilt further inland and reopened a year later. 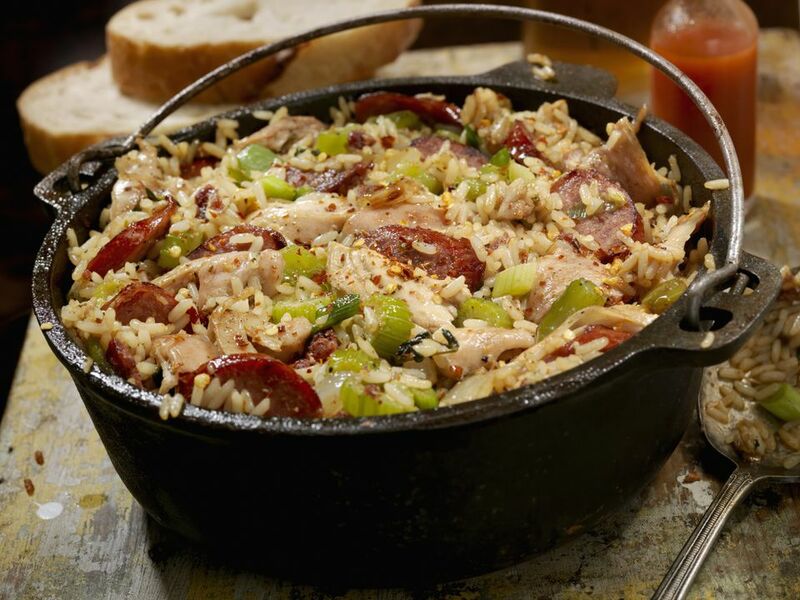 Jambalaya has its origins along the coasts of France and Spain and is served along the Gulf in both Cajun and Creole varieties. Although there are subtle differences, many recipes include the so-called "Trinity" of celery, onion, and peppers. In Mississippi and Louisiana, however, many servings are prepared without vegetables. It's possible to dine in a different restaurant each night of your stay, order jambalaya, and savor a distinct recipe at every sitting. Felix's Restaurant & Oyster Bar in Gulfport serves up a version that includes shrimp, Italian sausage, smoked sausage, and chicken. Perhaps it's the tempting alliteration between Mississippi and mud that produced this name. Don't try to make much sense of it. There are closely guarded mud pie recipes from Pascagoula to East St. Louis, but most of them bear some resemblance to a chocolate brownie with pecans, topped with chocolate icing and melted marshmallows. The trick is to serve the pie while still warm with a generous scoop of vanilla ice cream as a topper. The Chimneys in Gulfport will set this delicious treat before you.